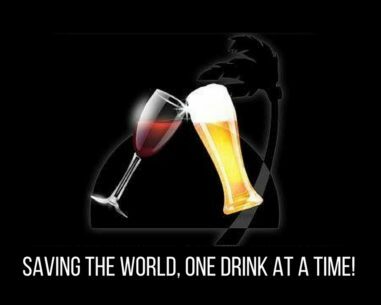 Enjoying a glass of wine or a cold beer is one of life’s simple pleasures. What is not enjoyable, however, is when your beverage is constantly tipping over in the grass, on a picnic blanket, in the sand, or in your lap. SunChaser Products is a Seattle-based company and the creators of two unique outdoor beverage holders that will secure your drinks so you don’t have to. 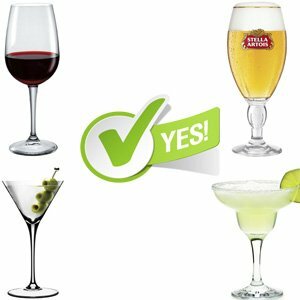 BELLA D’VINE®, a multi-purpose outdoor wine glass holder, secures many different styles of glassware from wine, margarita, martini, and even Stella beer glasses. No more spilled wine! 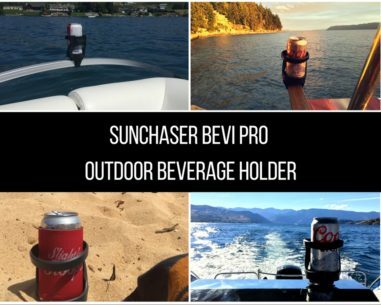 SUNCHASER BEVI PRO, the ultimate outdoor drink holder, was designed for cans, bottles, solo cups and a wide variety of travel mugs and water bottles. BELLA D’VINE® and BEVI PRO come equipped with a compact lawn and sand stake, adjustable arm chair strap, a quality suction cup base, and carrying bag for easy transport in your pocket or purse. HOW DOES BELLA D’VINE WORK? HOW DOES SUNCHASER BEVI PRO WORK? SUNCHASER BEVI PRO is a versatile cup holder and is the essential drinking accessory for anyone who enjoys their beverages outdoors. With SunChaser Bevi Pro your beverage will be safe and secure from spilled drinks, broken bottles, accidental bumps, curious pets, or the rough wave that sends drinks crashing to an inevitable fate. 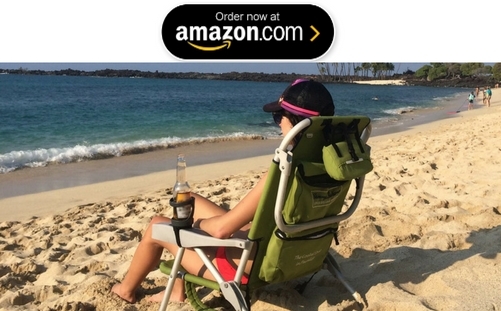 This unique beverage holder comes equipped with a lawn peg for grass and sand, a chair strap for chair arms and railing, and a quality three prong suction cup base for boats, RV counter tops, bathtubs, and hot tubs. This sleek & compact cup holder will fit conveniently in your pocket, beach bag, glove box, or RV cubby. Take it everywhere you go! SunChaser Bevi Pro is a great gift idea for her, a gift for dad, and best of all is a gift for under $20. BELLA D’VINE is the outdoor wine glass holder that makes life easier and more relaxing during your events and leisure time. 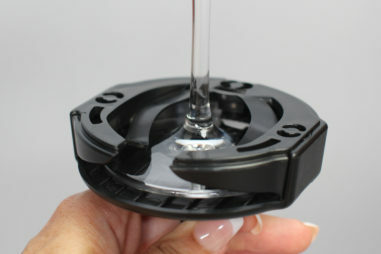 You can now rest assure your wine glass is safe and secure while you read, eat, converse, boat or just sit and relax. This innovative outdoor wine glass holder comes with a compact lawn peg, adjustable velcro strap for patio chairs or railings, a suction cup base for boats, hot tubs, and bathtubs AND it all fits nicely in your pocket or purse. BELLA D’VINE + SUNCHASER BEVI PRO is the PERFECT combo for all of your happy hour needs! 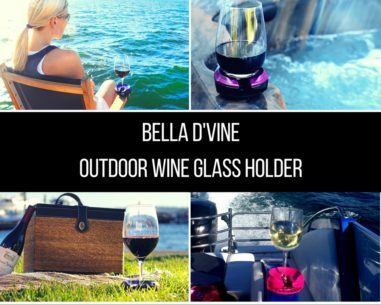 Bella D’Vine wine glass holder + the suction cup attachment is a great gift idea for boaters! Now you can have guests on your boat to enjoy a glass of wine with the peace of mind of a secure glass. Bella D’Vine isn’t just another wine gadget! The magic behind Bella D’Vine is tucked away in the base of the holder. With its patented design, you can easily slide your stemmed glass in and out of the holder while the two prongs work to protect your glass from accidental spills – even when tipped sideways at a 90-degree angle! Learn more about how Bella D’Vine works by visiting our product page on Amazon. 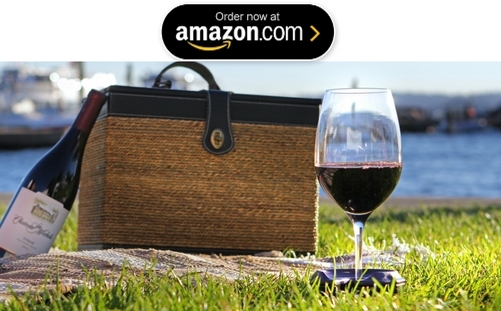 It's perfect for enjoying in the park or beach with a good book and a glass of Woodinville's finest wine. Even better at a summer concert in the park. No tip-overs! We think this is an absolute winner and can’t wait to test about six of them in the Downtown Sailing Series. I have used my wine holders and LOVE them! Not to mention the fun conversations that happen when friends start inquiring about their unique functionality. Great product! I first met the SunChaser team at a trade event, and from the moment I saw their products, knew I wanted to work with them. Chris & Stacey are great to work with, and the finished product they're delivering is going to be a HUGE hit with our viewers and listeners. I love this product! Wheather in the sand, at the park, on the boat, this Northwest girls won't leave home without it. So portable too! This is the best product out there! I cannot recommend this enough. My go-to gift for all wine lovers. I bought this at an outdoor event. I love it. Fits on my wicker chair and I can use with stemmed or stemless glass. Buying some more for an upcoming sailing trip! I purchased these wine holders for an event recently and I love them. They were extremely useful at a lawn seating music event. I purchased extra as I knew my friends would want to use them as well--they loved them. Best thing ever for keeping your wine glass from spilling. I love how compact and functional it all is. Amazing product! This product is so awesome! It has come in handy in so many out door activities! We do a lot of boating and sitting on the beach so these wine holders are perfect for us! Very versatile! Awesome wine glass holder. Love the versatility. So far, I have only tried the Velcro straps (attached to my porch swing), but all pieces seem sturdy and functional. Nice carrying case also. This wine glass holder works great on my boat. I purchased 3 of these last summer and what a great product. The traditional cup holders on my boat did not hold wine glasses very well, I had broken wine glass stems and spills all the time. Now I simply pull out the Bella D'Vine Wine Glass Holder when we get to our favorite beach and use the suction cup adaptor to affix it right to the boat. No more spills or broken stems on the river. I am now the proud owner of at least a dozen sets of these and just love them. I give them out as hostess gifts and bring them with me any time we're heading out for a picnic (I grab either the stake or chair strap attachment) and use the suction version when we're in the hot tub or out on the boat. I'm constantly getting asked by strangers where to get these. Such a cool product! "I first met the SunChaser team at a trade event, and from the moment I saw their products, knew I wanted to work with them. Chris & Stacey are great to work with, and the finished product they're delivering is going to be a HUGE hit with our viewers and listeners." "I have used my wine holders and LOVE them! Not to mention the fun conversations that happen when friends start inquiring about their unique functionality. Great product!"